The treatment goal in people severely affected with AIED is to improve their hearing/discrimination enough so that they can benefit from wearing hearing aids. 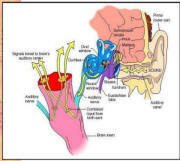 In those with mild to moderate losses, the goal is to recover hearing to normal or near normal levels. Doctors think that AIED is potentially reversible. Therefore they like to treat it with steroid drugs and see if they can stop the progress of AIED or make it retreat since steroids are the drug of choice for other autoimmune diseases. Sometimes it seems to work. Sometimes it doesn't do a thing. In fact, doctors don't have a clue what would happen if no treatment was given since, when patients come to them, they always "try" something. Dr. Shelley Broughton wrote, "The natural history of untreated immune-mediated inner ear disease is unknown at this time." In other words, doctors don't know what would happen if they kept their hands off and let nature take its course. Because many doctors believe that AIED is caused by inflammation and altered immunity, they try the same immunosuppressive drugs they use to treat rheumatoid arthritis and cancer. According to the American Academy of Otolaryngology—Head and Neck Surgery, Inc., they use high doses Prednisone,Methotrexate, and Cyclophosphamide, but with "little guidance about dosages or duration of treatment and with less than ideal proof of efficacy." If you are going to go the drug treatment route, you need to begin promptly. This is extremely important to have the best chance to recover or at least stop the hearing loss. However, aggressive treatment doesn’t necessarily work. In spite of the best treatment from the best doctors, you may still lose your hearing. Not all people respond to steroid therapy the same way. Treatment in some people results in better hearing, or better discrimination or both. With others, hearing fluctuation or hearing loss progression stabilizes where it is without improving any. With the remainder, they continue to lose their hearing in spite of immunosuppressive therapy. In cases of rapidly progressing bilateral hearing loss, doctors try steroids such as Prednisone (Deltasone) or Dexamethasone (Decadron) for 4 weeks. If the person responds to this treatment, then they often put them on long-term chemotherapy drugs such as Cyclophosphamide (Cytoxan),Methotrexate (Rheumatrex<), orAzathioprine (Imuran). In one study using Methotrexate, the patients had significant improvement in their discrimination scores, but did not have any improvement in their hearing. Overall, steroid response rates are approximately 60%. The best relief is from intra ear injection. Success is defined as a hearing improvement of just 10-15 dB, or a "significant" improvement in discrimination scores. For a severe loss, this is not all that great an improvement, but at least the hearing loss isn’t progressing any more! Plasmapheresis treatment may also be beneficial. This involves filtering the patient’s blood, which removes antibody, antigen, and immune complexes and other immune mediators. 75% of the patients in one study regained some of their hearing after this treatment. The anti-TNF drug,Etanercept (Enbrel) shows promise too. Prednisone, although an effective immunosuppressant drug, has a host of negative side effects, especially in the long term. You want to be aware of them. You need to know that you can get both cataracts and glaucoma (among other things) from takingPrednisone. If thePrednisone treatment isn’t successful in restoring your hearing, you could find yourself up a creek without a paddle, ending up both hard of hearing and without much sight. You also want to be careful when taking any cytotoxic drugs because their side effects can also be serious. For example,Cyclophosphamide is often prescribed, yet it can cause increased risk of malignancy (cancer). The best drug for early treatment isIVIg. This will reverse the disease if diagnosed and treated within the first two years. Caution: None of the above drugs are meant for long-term use—unless you like horrible side effects messing up your body. One person who had that experience warns, "If steroids don't regain or stop your hearing loss, get off them after just a few weeks." (I'd suggest that if there is no change within 4 weeks, these drugs are unlikely to help you and you should dump them before their side effects totally mess up your body.) Also, if you have had a sudden hearing loss for more than a month or two already, don't expect the steroids to really do much to help you regain your hearing. By that time, the chances of getting your hearing back are minimal, so why risk all the nasty side effects with so little chance of success? If you have (or think you have) AIED, talk with your doctor—preferably an otologist (or neurotologist).Together decide on a course of treatment (if any) that fits your particular situation and takes into consideration the risks that are acceptable to you.